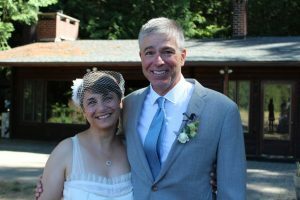 Robin and Pete did it ‘their way,’ getting married on an early Sunday morning at The Museum of Flight (before opening). I remember Robin getting her hair and make-up done and how she got into her gown. Simply, so easy and so quietly beautiful. Emily and Christian were so excited, not only about getting married at Stimson-Green Mansion, but their honeymoon to Scotland…and I felt their excitement. This young couple, together for so many years, are one of those darling pairs meant to be. 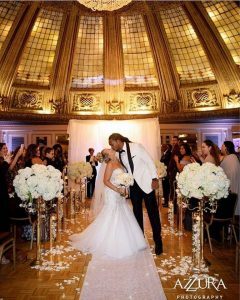 If there ever was a couple who put great and conscious intention and time into their wedding ceremony and celebration, it is Donte and Sara. Married at the Lake Union Cafe, we had a ceremony with great personal touches and afterwards, a ‘skit’ that is now up on YouTube. Who gets married on a weekday, a formal wedding with all of the trimmings? Felix and Sandra do! They said “I Do” at Thornewood Castle on a Tuesday afternoon, surrounded by 50+ family and friends. A solid and seriously fun-loving couple…and such a beautiful bride with a veil that had a mind of it’s own! Courtney and Julio. I loved everything about Courtney and Julio. Their great devotion, their relationship journey and watching Julio with Courtney’s two young girls before ceremony and the love they have as a family, made my heart so very happy. 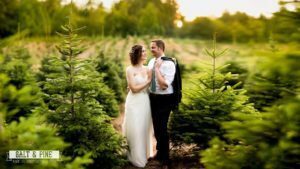 Elope to Seattle from Oklahoma! Trenton and Holly found their way to The Salish Lodge with Trenton’s Mother and Holly’s Grandfather, and in-between rain bursts, were married outside on the lawn. Chilly, sunny. I remember happiness and very wet feet! And they did it! 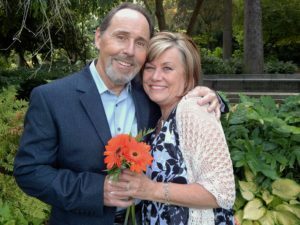 At mid-life, Rik and Gina got all hitched up at The Willows Lodge, surrounded by the people they love the most in the world. You know the word ‘graciousness?” These two lovebirds could be poster kids for such gracious hearts. Sydney and Matt, in a most precious and intimate ceremony, re-married. What is big, is small. What is small, is big. It was truly an privilege to stand with these two as they re-committed for a lifetime. It’s a great joy for me to work with so many diverse couples. Every couple has a unique story and path to a lifetime commitment. Nothing was going to keep me from getting three beautiful couples married this weekend, including yesterday – an official ‘snow day’ in Seattle. I may not have been a pretty picture in my snow boats and huge coat, and with a car stuffed full of supplies, ‘just in case,’ we pulled it off. 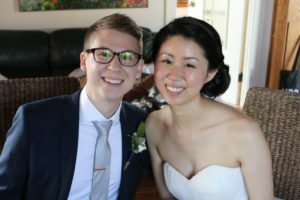 Matt and Rae Ann were married in their suite at The Salish Lodge on Saturday night, surrounded by a small group of people who love them dearly. Ryan and Tracey exchanged vows in front of family and friends, many who travelled to Seattle to be with them. All of this goodness was on Sunday (yes, Super Bowl Sunday!) at Ivars Salmon House on Northlake Way. 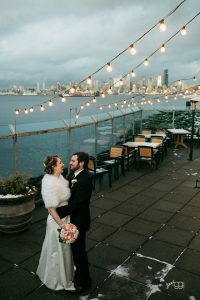 Last night, Salty’s on Alki, opened their restaurant just for Justin and Caroline, keeping their promise to host their wedding and reception. We had Justin’s parents and family from Texas and New Mexico and Caroline’s Mother and family from France…together, we got them beautifully married! There are a zillion articles out there offering marriage wisdom and counsel. It’s from the Huffington Post. It offers a bit of marriage guidance that most assuredly most Mothers WOULD NOT offer on a wedding day! Julie + Briana: We Raised The Roof Off AXIS in Seattle’s Pioneer Square With One of the Best Ceremony Toasts, Ever! Julie + Briana, sweetly married at AXIS in Pioneer Square on January 14th. I love this photo, taken in flight, on their way to a much anticipated honeymoon in Iceland! Julie and Briana had a vision for their ceremony and what was vital to them. Including their family and friends, particularly their niece and nephews was hugely important. We got the children beautifully down the aisle and each participated in a hand-fasting ritual. Emotion. So much emotion. 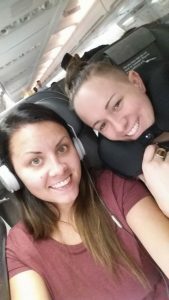 These two women, on a relationship path of 7 years so far, are one inspiring duo. During ceremony, we celebrated their history, joys and happiness, ups and downs, funny moments and more. I loved that Julie and Briana wanted it real – we kept it real. The memory that I left with the most? 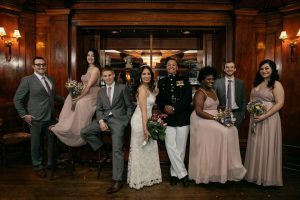 A well orchestrated ‘forever and ever’ toast within Julie and Briana’s wedding ceremony – celebrating not only the two of them, but a toast that honored the love of each person in the room. At the end of the day, Julie and Briana worked to design and host a ceremony and celebration that was truly lovely, reverent and so much fun! Comments Off on Julie + Briana: We Raised The Roof Off AXIS in Seattle’s Pioneer Square With One of the Best Ceremony Toasts, Ever! Could Saturday evening have been any better? Two loving people, with a fabulous football themed wedding, were beautifully married and The Seahawks won! Chris and Brandie, in the presence of 100+ family and friends, shared vows at the lovely Cedarbrook Lodge on Saturday evening. Fast forward through much shared life experience, history and love shared, these two devoted and fun-loving people, exchanged heartfelt vows and shared in a ceremony that honored Brandie’s 3 children, expressed gratitude to parents and family, celebrated Chris’ guardian angel and included a family ‘glass pouring ritual.’ And of course, we announced the game score as Chris and Brandie finished walking down the aisle! I appreciate a couple who desires a ceremony that eloquently not only celebrates their love story, but one that embraces the people they love most in the world. Chris and Brandie, I wish you much happiness! I appreciate a couple who has their priorities in order. I know, this sounds most likely a bit stuffy and boring and it’s true. Especially when it comes to a wedding ceremony. 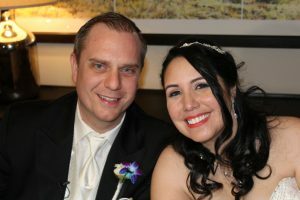 It was happiness for me to join Frank and Angela for their wedding at Seattle’s Arctic Club Hotel on December 3rd. Working together, we crafted a ceremony that not only shared pieces of their personal story but a personal ritual that offered gratitude to family and friends and created a special family moment with Frank’s son. Frank and Angela’s ‘family first’ approach to life (a priority) was front and center as we celebrated the two of them and the people around them. 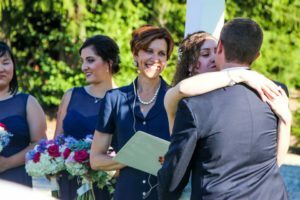 Tender emotion was ever-present as Frank and Angela exchanged vows and rings…I had to smile as I heard Frank share sweet nothings with his bride throughout the ceremony as we made our way to the big kiss! I had one of these moments when I arrived for Mark and Joanna’s Friday morning wedding ceremony in August, at Hilltop, in the Grand Forest of Bainbridge Island. A wonderful group of family and friends were gathered. Musicians were set up and getting in place. The ceremony space was beautifully designed in a series of circles, symbolizing the union of two wonderful people. And so, we had a romantic, intimate and joyfilled ceremony for Mark and Joanna, celebrating their path to this day and their family and friends. Best yet, Bainbridge Island is Mark and Joanna’s new home and this grand day is just of many wonderful experiences to come on their beautiful Island! Moments before Rachel walked down the aisle, she was with her wedding party and family. And I found her holding onto her exuberant dog, Odin. At rehearsal, Odin was very high energy and all dog. 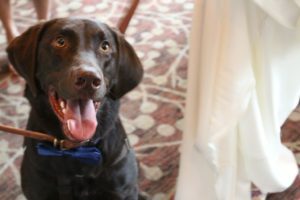 The next day, on his people’s wedding day, this wonderful dog easily and gracefully walked down the aisle and took his place…seriously, Odin did so very, very good! 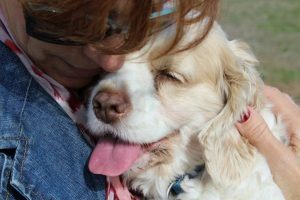 I loved that Daniel and Rachel incorporated their sweet pooch as an important part of their ceremony and celebration at The Salish Lodge. A dog always raises the joy bar at a wedding and Odin did his part. 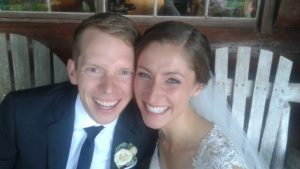 Daniel and Rachel, I wish you a life of great adventure, happiness and joy. 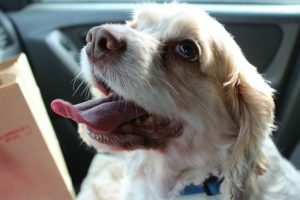 And lots of outdoor adventures with your beautiful boy! Marriage is a crazy affair. It’s over-the-top joy. It’s chaotic and messy. It’s about learning, growth, stretching and finding the depths of compassion and resilience. It’s about friendship. It’s about endurance and nurturing stamina and curiosity in the midst of upset and change. It’s about truly celebrating the ordinary moments and the extraordinary ones. John and Jaime embody the best qualities of loving relationship. And this I know for sure: they have what it takes to create, nurture and protect a devoted relationship that will take them through the years and decades. 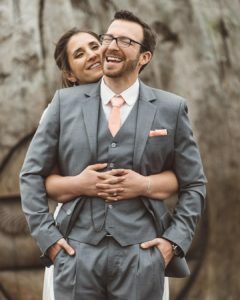 On a lovely Summer Sunday, it was my happiness to travel to Kiana Lodge in Poulsbo (one of my most favorite venues) to get these two lovebirds married. John and Jaime, you invited me into your home and personal space. You trusted me with your journey and story and I am so grateful for this gift. Wishing you great happiness, joy and adventure! In the moments before they walked down the aisle together at the Mayflower Hotel in downtown Seattle, I joined John and Elizabeth in their suite. I love quiet moments before a wedding ceremony. The few minutes before a huge life shift occurs. And within minutes, we were in the elevator and making our way downstairs to be greeted by dozens of thrilled family and friends, who welcomed John and Elizabeth to their ceremony with a great round of boisterous applause. What I love about John and Elizabeth is not only their smarts and fun-loving approach to life, but their loving graciousness. It was important to both of them to have John’s adult children stand as their best people. Within ceremony, we acknowledged not only John and Elizabeth’s marriage and partnership but the new family created by this union. 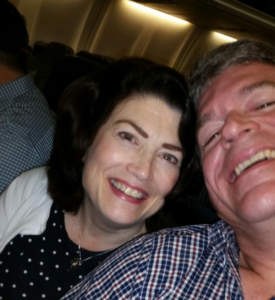 Photo: Sent to me from the plane, honeymoon bound! Nicole + Kimball: Two Loving and Inspiring Sweethearts With The Most Fabulous Wedding Party! I’ve been around a lot of wedding parties ~ some big, some small. Some traditional and quiet. And some loud, feisty and with a bit of rock ‘n roll. I could go on and on as wedding parties are just that…all different. 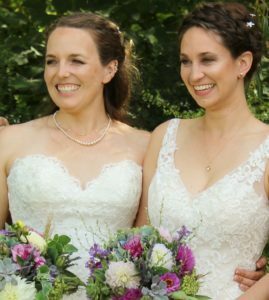 As I reflect on Nicole and Kimball’s beautiful wedding ceremony and wedding day at The Pickering Barn in August, I can tell you these two lovely women had one of the happiest wedding parties I’ve been around, ever. As I was sharing Nicole and Kimball’s love story and personal details about their path to August 21st, it was fun to hear muted comments and generous applause from their joyful wedding party on either side of us. What I loved even more is that this delight and exuberance was shared by family and friends…seriously, the happiness was coming from all sides. Often before going down the aisle, or even during rehearsal, I encourage a wedding party to fully participate in ways that are authentic, genuine and meaningful. This may mean big great smiles going down the aisle or even hand motions, genuine giggles and even a ‘high 5’ during a ceremony. A wedding party that is ‘in motion’ raises the joy bar in the room and Nicole and Kimball’s fabulous group did this and more. Sweet ladies, you have such great love and support around you! Comments Off on Nicole + Kimball: Two Loving and Inspiring Sweethearts With The Most Fabulous Wedding Party! Most often before I begin a wedding ceremony, I walk to the front of the room. I thank family and friends for attending and give them direction on what to do during ceremony (if anything) and what’s happening after the bride and groom walk down the aisle. This is an opportunity for me to also check my mic for the last time and to get a sense of ‘faces.’ Yes, faces. I want to get a sense of the crowd, big or small, and what the ‘energy’ is like in the room. This can be quiet and sedate, peppy and fun-loving or perhaps somewhere in-between. When I did this for Tim and Diana at the Monte Cristo Ballroom on a lovely Friday afternoon last month, I saw beaming faces. A lot of smiling faces. I saw and felt great joy, elation, anticipation and happiness AND the wedding ceremony had not even started yet. This kind of love and care always brings great happiness to my heart. Because I know before we even start that everything will be okay – that we’re all present for the right reasons and even if something blows up or goes side-ways (which it does on rare occasion), that with a little self-deprecating humor, everything will be more then fine. It will be real. And that’s what I love most about a best ceremony. It’s darn real. Tim and Diana, the realness of your love, relationship journey and path to your wedding day makes my heart happy. Thank you for inviting me into your personal space and trusting me with your wedding ceremony. I wish you the blessings of great happiness, growth, courage and joy! Lacee + Bryce: Just the Best Couple, A Very Warm Wedding Day = LOVE. This marriage thing isn’t for the faint hearted. For those of us in long-term relationship, navigating the ups and downs of careers, jobs, illness, loss/grief, disappointment, elation, aging, huge change, kids and more is a daily juggle. 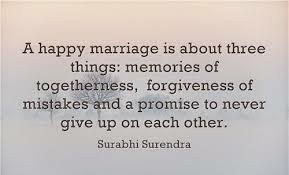 Marriage is about jumping off a cliff, knowing what we know and knowing what we don’t know. Lacee and Bryce were clear with me when we first sat down together. They wanted me to ‘get them’ and celebrate where they’ve been, where they were on their big day and their intentions for their future. It was my happiness to launch this pair of sweethearts on their marriage adventure. Lucky, lucky me! Comments Off on Lacee + Bryce: Just the Best Couple, A Very Warm Wedding Day = LOVE. I have this really sweet memory of Clint and Josalyn’s Seattle wedding day. Because of special logistics at their venue, Melrose Market, we signed marriage license documents on a cocktail style table, at the top of a stairwell, with beautiful light streaming in. It was the two of us, witnesses and their photographer. I watched Josalyn lovingly touch Clint’s arm several times during the signing. During all of this, I loved the way that Clint kept looking at Josalyn and his outward affection and joy to be with her. While we had a beautiful and personal ceremony, it was this stairwell moment and other personal glances and touches during their ceremony that reminds me that the best moments of a wedding day are most often the unexpected pieces that write a lifetime story. Josalyn and Clint, thank you for giving me the privilege of sharing in your slice of happiness! As I was writing Jason and Laura’s wedding ceremony, I was touched by the amount of personal time and energy they were putting into small and big touches on their wedding day. For instance, the Chuppah under which they held their marriage ceremony, was hand-crafted by Jason and Laura’s Father, Rik. As Laura shared with me, bonds and relationships were strengthened during the creation of this Chuppah, which made their wedding day more meaningful. And for ceremony, under the loving guidance of Wedding Planner Wendy Wojcik, all went beautifully. 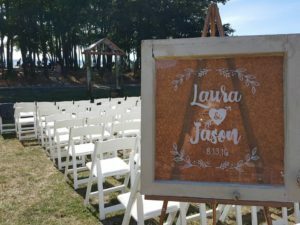 Jason and Laura – here is to your marriage adventure! If there ever was a couple meant to love and marry, it’s Sam and David. And it was my happiness to join them on their wedding day at Kiana Lodge…that much happier because it was the 4th of July! Joined by 100+ family and friends, we celebrated Sam and David with the gift of a gorgeous ceremony overlooking the water on the grounds of one of my most favorite venues ever for a ceremony, Kiana Lodge. Within Sam and David’s ceremony, we incorporated personal elements including a few ‘surprise photos’ taken during ceremony by this very loving and sweet duo (see photo at right). Most of all and with much happiness, I smile as I remember these two Sweethearts and wish them much happiness on their marriage adventure! Annemarie, you were the sanity-glue, the voice of blessing, the glowing smile and the entertaining emcee for our day and it could not have gone better, thanks to you. You exceeded our expectations by giving us the gift of a heart-felt and tailor-crafted ceremony. "As we sit here on Hood Canal, we are talking about how perfectly you captured us as a couple during our ceremony. Authentic and genuine are two of the most important feelings in our lives and you helped us feel both of those yesterday. Thank you so much." "So nicely done, Annemarie! Thank you from the bottom of our hearts. I know that my Dad is not easily impressed and that he wanted everything about our wedding day to be perfect. And he was so taken with you and your work that he found your name on our program and looked you up online to learn more about you!" "Annemarie – thank you so much for surpassing our expectations! You were a breath of fresh air during a time that could have been completely stressful. I cannot tell you how many people said our ceremony was the most fun and most moving ceremony they’d ever been to! We are forever grateful." 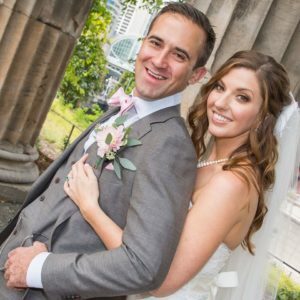 "Annemarie – we can’t thank you enough for giving us such a beautiful and touching ceremony on our special day. Thank you doesn’t seem enough to express our appreciation. We couldn’t have scripted our ceremony any better and we wouldn’t change a thing. You were so amazing today!" 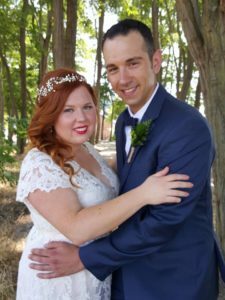 "Dan and I loved the ceremony you delivered – a beautiful, warm and inclusive ceremony that everybody enjoyed. 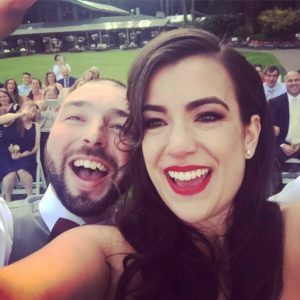 I can’t tell you the number of people that came up to us and asked how long we had known you, which only goes to show the commitment you have to delivering such a wonderful day for a couple."